An enthusiastic group of people ranging in age from 8 to 83 joined in the dance of mathematics activities. On the Friday night, the Gaiety hall rang to the playing of the HRC trio, Heather (accordeon), Roger (flute and doodlesack) and Claire (violin). Bill stepped everyone through their paces. The dancing was easy and fun, and everyone had a great time! 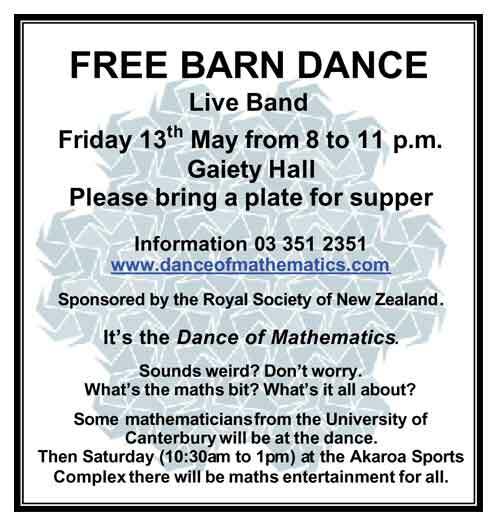 The maths was very low key during the dance, mainly introducing the mathematicians on the dance floor, and describing the next day's plans. Roger (with the help of young Elizabeth) demonstrated the doodlesack and the maths of the musical notes. On Saturday morning around 30 people came to the Akaroa Sports Complex. Some schools from the outlying bays had sent kids, so there was a small vocal cheering section for "The Great Burke," aka Burkard Polster. His juggling kicked off the event. 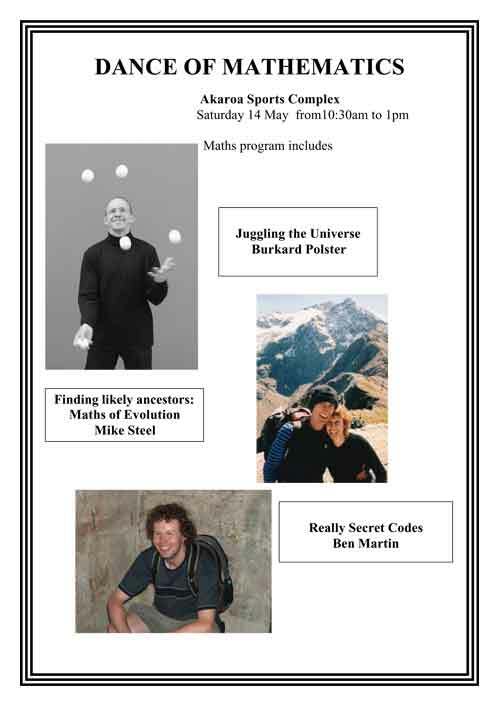 After morning tea, while some of kids rushed around outside, Mike Steel aimed his talk at the adults and conveyed a good impression of the importance of modern math to biology. It was interesting that mathematicians first figured out that hippopotami and whales are related! Ben Martin finished off with "Really Secret Codes." He got everyone involved and then sent the kids off to work with the math helpers to find the 'secret' pictures, while he went into some more detail about codes for the older members of the audience. 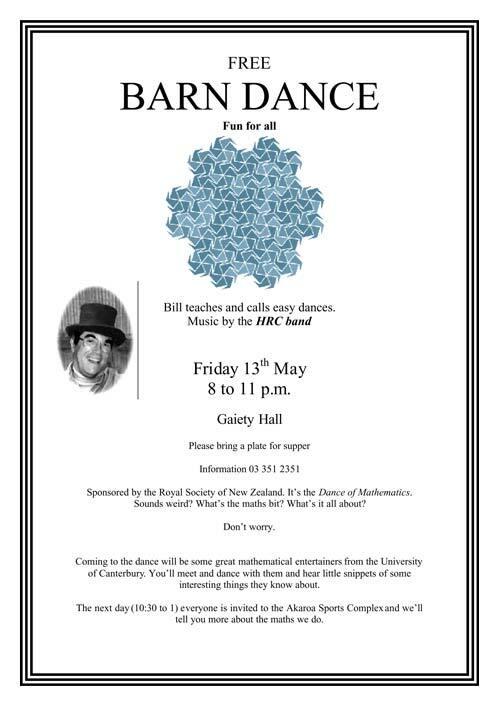 For Bill, there was a bit of nostalgia to this dance as he was in a bush band that used to play regularly in Akaroa about 20 years ago. It was great to come back to the scenic harbour again. Thank you to those who came to our events, and you may want to check out Campbell Live on TV 3 on Friday 20 May at 7 pm. Media Release download word format.